President Mahinda Rajapaksa paid obeisance to the historic Jaya Sri Mahabodhi and obtained blessings for the New Year this morning on 18 April. The President thereafter called on the Chief Incumbent of the Atamasthana, the Ven. Dr. Pallegama Sirinivasa Nayaka Thera and received his blessings. Subsequently, he joined the religious observances held beneath the Ruwanweli Maha Seya. The President who called on the Chief Incumbent of the Ruwanweliseya the Ven. Pallegama Hemarathana Thera exchanged pleasantries with him. The prelate chanted Seth Pirith and blessed the President. He did not forget to exchange pleasantries with devotees who were present at the Anuradhapura Sacred site to obtain blessings for the New Year. 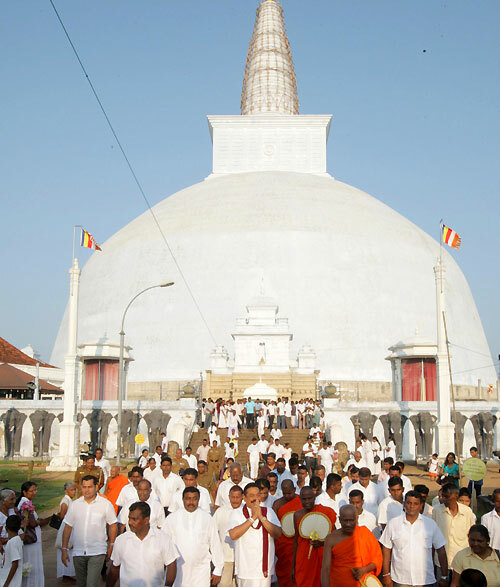 President Rajapaksa also visited the Mirisawetiya Raja Maha Viharaya and paid obeisance there. He then paid a courtesy call on the Chief Incumbent, the Ven. Ethalawetunuwewe Gnanathilaka Nayaka Thera and inquired into his wellbeing. In the meantime, President Rajapaksa who visited the Sri Sambuddha Jayanthi Viharaya in Anuradhapura last evening called on its Chief Incumbent the Ven. Nugathenne Pagnananda Thera and secured his blessings. He also visited the Lankarama Viharaya and called on its Chief Incumbent the Ven. Ralapanawe Dhammajothi Thera who too blessed the President.